This unit will allow you to test for both the pressure and flow of your water supply. Checking the flow of any irrigation system is critical knowledge. With this information you may plan a system that will work correctly. A must for planning any gravity feed system!! This manifold is made to connect to any garden hose or hose faucet. It will also work for any 3/4" PVC size irrigation pipe with the correct adapters. Best yet all the components can be taken apart and used elsewhere in your drip system. The ball valve has fittings glued to both ends which are female hose threads. These are common connections in a drip system. Read the instructions below on how this works. This will show you how to find your water flow at any given pressure. 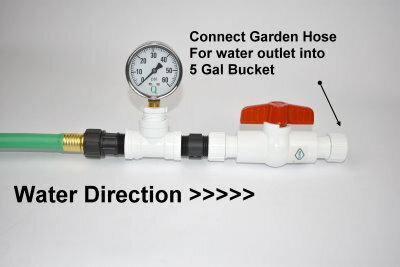 Attach the water inlet side of the test manifold to your hose faucet or to a garden hose attached to your hose faucet. Attach another garden hose to the outlet side of the manifold. The shorter the hose the better. Have a 5 gallon bucket with you. Available at most home centers or chain hardware stores. Most auto parts stores have them also. Make sure the PVC ball valve is turned off. Turn on the water supply to the manifold. 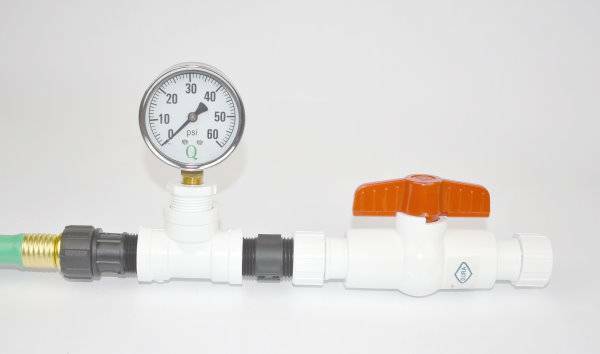 Slowly open the PVC ball valve on the manifold until the pressure gauge shows the pressure you want to have in your system. 25 PSI is what we suggest for most homeowner systems. Once the water is running steady throung the outlet hose have your timer ready and then place the outlet hose in the bucket. Using your timer time how long it takes to fill the bucket up t the 5 gallon mark. Once the bucket is filled to the five gallon mark write down the amount of time it took. Then turn off the water. Take the time it took to fill the bucket to the 5 gallon mark. We are going to use 40 seconds for our example. You might fill it much quicker or slower. 40 seconds is just an example. Take the 5 gallons and divide it by the time of 40 seconds. 5 divided by 40 = .125 this is your gallons per second flow. So you now know that at 25 PSI you can supply 450 GPH to your drip systems. You can go back and do this same procedure for different pressures which can help you in designing your system(s). You may also use this for your lawn sprinkler systems to make sure you do not place too many sprinklers on one zone.